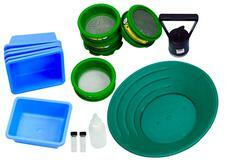 Looking for a gold recovery product that can process tons of concentrates into mere ounces? The Gold Cube retrieves your gold from black sands! With a small 12 volt pump (included) and a 12-volt battery (not included), you're ready to clean up your concentrates QUICKLY! 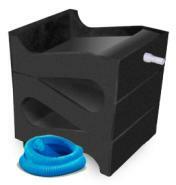 It can run a yard of material (classified down to 1/8 inch) in about 2 hours. You can also run half a ton of material through the Gold Cube before you have to stop for a clean up. The Gold Cube is made in the USA and is a small enough to fit into the trunk of your car. It consists of stacking trays made of indestructible plastic LDPE (low density polyethylene) that's as thick as a cutting board. 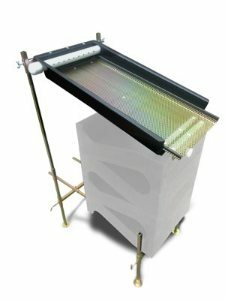 A basic Gold Cube consists of 1 slick plate and two concentrator trays, but add as many trays as you like, depending on your specific needs and location, it's totally up to you! Ready to go right out of the box! Unique G-Force technology cleans and separates the gold. 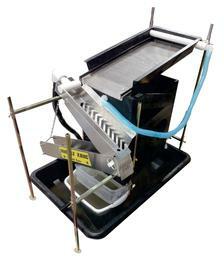 Vortex matting traps gold and self cleans for hours of use. Patent-pending, proven product backed by countless hours of research & development! Gold Cube inventors Mike Pung and Steve "Red" Wilcox say that they like to think "inside the Cube" instead of "outside the box." Instead of building a better mouse trap, they built a better gold trap! If you've been prospecting for very long, you've probably come to realize that most of the large gold nuggets that were once lying on or near the ground surface were scooped up by the Stampeders and '49ers long ago. Not that nuggets still aren't found, because they are, but fewer of the chunky stuff was left behind by the Old Timers. The good news is that those same Old Timers did not have the benefit of Gold Cube technology, and literally left tons of fine gold behind for YOU, the astute modern-day prospector to recover. 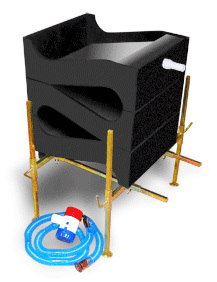 ACTUAL CUSTOMER COMMENT: "I just wanted to say thank you for the best system I have purchased for gold mining. And believe me I have bought more than 5 different systems. I primarily mine on the Pacific Coast dealing with heavy black sand, and there gas not been a system that does a better job than the Cube. And what's real nice it works that we'll on the hard rock stuff we do as well. I tell all my buddy's about it. Just wanted you to know what a quality product you have. Thank you." 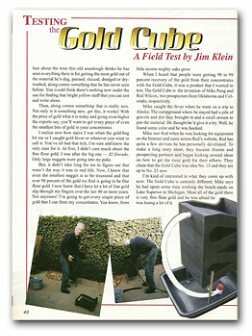 Scroll down this page to learn more about how and why the Gold Cube works so well. Gold Banker classifier that fits on top off the Gold Cube! Gold Cube Trommel really speeds up production! 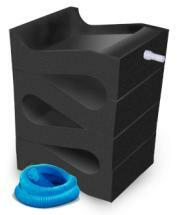 FREE SHIPPING!� 4-Stack Gold Cube includes: One Slick Plate, Three Separator Trays, Hose and Adapters. 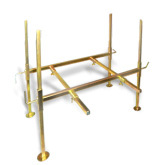 Gold Cube Trommel - FREE SHIPPING! Single Separator Tray weighs 5 lbs. 12 volt Gold Cube Pump. Poly Hose available in 10, 20, and 30 foot lengths. Want to learn more about the Gold Cube and Gold Banker from the inventor himself? 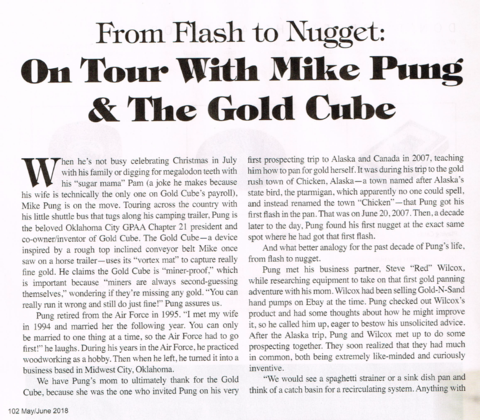 Mike Pung was interviewed recently on Gold Talk Radio. Click here to listen to that radio show. 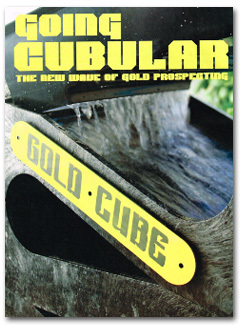 Click here to download Jim Klein's review of the Gold Cube from Nov/Dec 2011 issue of Gold Prospector Magazine! Download .pdf article from May/June 2018 Gold Prospectors Magazine. 2. The water flow forces the lighter particles ahead of the heavier material. It is quite exciting to actually see your fine gold creeping down the slick plate! Gold, the heaviest element in the slurry, will be the last to reach the trough. 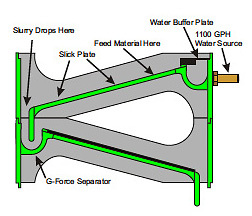 G-Force Separator. The slurry then falls into a gated trough and will be forced under water. Then centrifugal force will force the gold to the outer edge of the rounded trough. The slurry will then exit the trough on the opposite side of the gate. After exiting the gated trough, the slurry is forced to stand up and form a column. The purpose of this column is to actively stack the particles by specific gravity. Lighter, faster moving particles race past the heavier particles and exit the column first. The Gold Cube's forced gravitational, centrifugal and columning effect is called "the G-Force." Vortex Matting. The Gold Cube's vortex matting works because water flow interacts with a combination of very small pillar walls and cavities—about 7,056 of them per mat. Just like a tornado, the spinning creates a low pressure zone in the center of each of the cavities. Passing gold will be trapped and forced to the bottom of the vortexes and held in place by the lighter material. 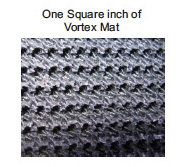 As gold-laden material is introduced into each vortex mat, it will displace and replace the lighter material. This will create about a cup of super concentrates at clean-up. Amazing! 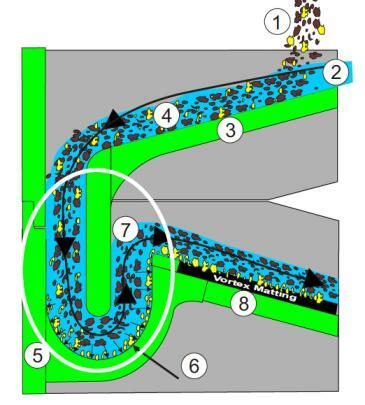 (1) 8 mesh or smaller gold bearing material is added to the water flow (2) on the slick plate (3). The slurry (4) drops into the G-Force Separator (5). 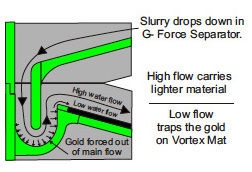 The slurry accelerates around the bottom of the trough and the centrifugal force helps move gold outward (6). 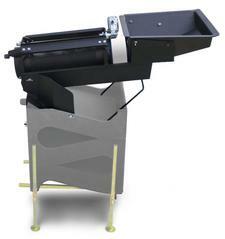 As all the material leaves the G-Force Separator, high volume water carries the lighter material up and away (7). The gold is then dropped into the beginning of the vortex mat (8). 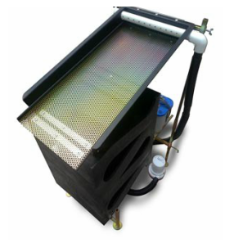 This process is repeated in each of the Gold Cube's separation trays. In mining, the low pressure zone behind a riffle— in a sluice or dredge— is called an eddy. The eddy rolls horizontally and the vortex churns vertically like a tornado. The vortex is the tornado effect that stirs up the dirt. The material churns and is really soft in the water, so the gold sinks to the bottom and stays there because it is heavy. Gold is about 19.3 times heavier than water. Click Here to Shop for Gold Cube and Accessories! Gold found in Montana after 10 hours of using the Gold Cube.